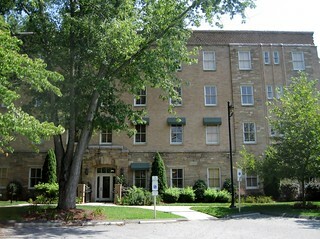 Biltmore Hospital in Asheville, NC (1930). It was designed by famed Art Deco architect Douglas Ellington to address the need for more space at the Clarence Barker Memorial Hospital. The "Battle Wing" of the hospital was designed by Ellington in a modern fashion, with a reception area, information desk, and telephone exchange. Enclosed sun porches were built at the end of the corridors on upper floors. In 1947, Biltmore Hospital consolidated with Mission Hospital and was converted to a OBGYN unit. It was the only hospital in North Carolina to specialize in the area. The hospital closed four years later and the building was sold to the Imperial Life Insurane Company. The company had Ellington design a two-story wing (not pictured) to house their mortage and accounting departments.